Along the lines of two other curiously named Santa Barbara businesses — I mean, of course, Artistic Nails and Unique Tan — here is a new example of an establishment forming its name by sticking an adjective onto the noun that is the product it delivers without enough consideration that the pairing might not be especially positive. Artistic Nails and Unique Tan are worse, I’ll admit, in the sense that artistic would be a word one might describe a botched creative effort and, similarly, unique doesn’t necessarily imply “good.” Personally, I’m too busy pondering the implications of an invisible taxi to bother calling it. After all, how I would I know when it arrived? And wouldn’t said taxi be in constant danger of being hit by all the visible traffic? 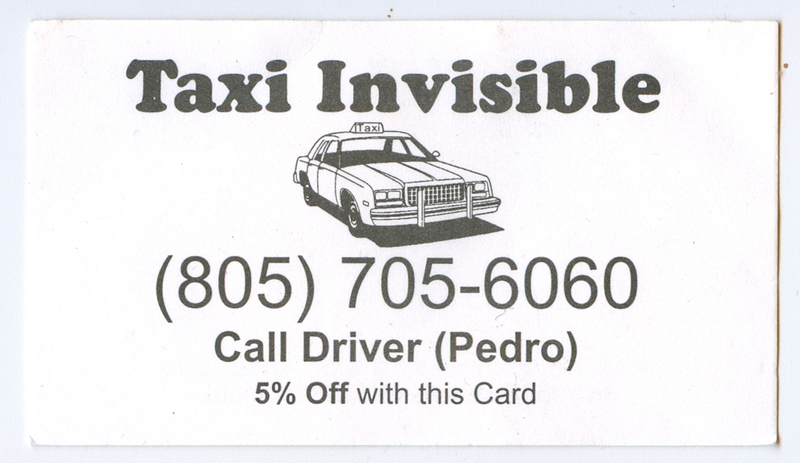 And that’s to say nothing of Taxi Invisible’s choice to put the word off in bold. Apparently they’ve had some confusion about how the discount works?